I’m guilty time after time of a horrific sin. I’m guilty of driving past an interesting dining spot, dozens of times, and dozens of times promising myself, that I would one-day eat there, but take forever getting around to it. Sadly, until today, I’ve been guilty of this sin in regard to Audrey’s Jamaican Cuisine. One of the best parts of blogging is that it forces a person, like myself, that kind of lives in a cocoon much of the time to get out, and really partake in interesting conversations with other professionals. Yesterday, I went to see my long-time friend, Chef Darwin Santa Maria at CeviChela. I don’t think that it is possible for two chefs to sit down, particularly when they haven’t had time to catch up for a while, and not talk about “their favorite restaurants, and places on their bucket lists to try.” I’ve been wanting to try this place forever, and when Darwin mentioned it as one of the places he’s been wanting to get to, I decided enough was enough. 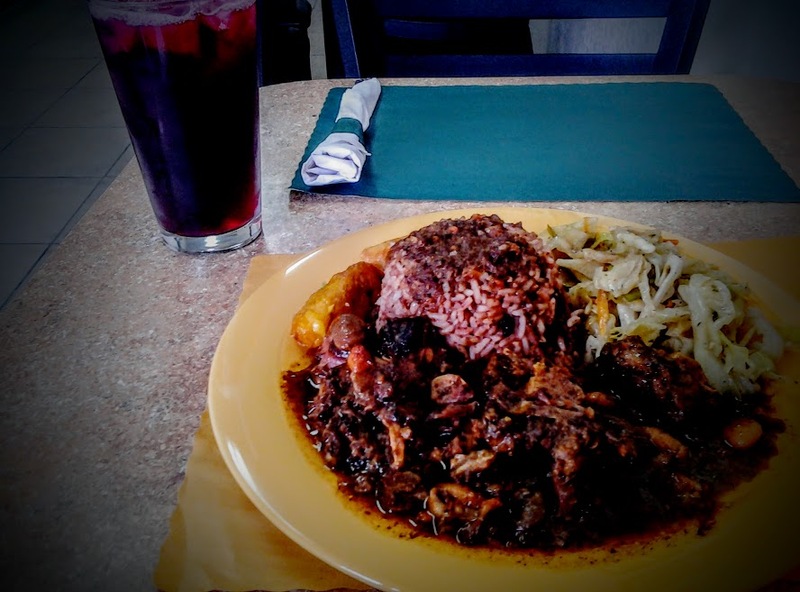 Audrey’s Jamaican Cuisine is near the intersection of Ashton and McIntosh Road in Sarasota. I discovered it when my Mom was in assisted living at Ashton Place just a few blocks away. The signs have it well marked, but I will tell you that it is in a very industrial part of the city. They are open Tuesday – Friday, from 11:00 – 5:00. The building is very simple, but I was instantly impressed with how clean and fresh everything was. From the moment I walked in, I had more of a sense of being in someone’s home, than in a restaurant. I was given one of the warmest and heartfelt greetings I’ve had the pleasure of receiving when I approached the counter to order. The gentleman that took my order was very kind and explained the menu to me with thorough detail. One of his concerns was my tolerance for spice…I assured him that he couldn’t hurt me, and I was game for anything. My mind was racing…was it going to be the chicken curry, the goat curry, jerk chicken…it all sounded so good…then he said the magic word…”oxtails.” At that point, the frenzy was over, as stomach and mind worked in harmony to make the decision. To say that my oxtails were good, would be like saying Sir Edmund Hillary was the first to climb that “hill.” They were so moist and flavorful, falling off the bone like the chunks of meaty love that they were. The sauce was rich and coated the meat like a warm blanket. I was also served a generous portion of rice and peas, which I mixed with the sauce and devoured. The vegetable today was cabbage with shreds of carrot, which was quite flavorful, and had the perfect amount of crunch. Bright yellow ripe plantains garnished the beautiful plate. When any chef learns about a new food, it is always a very good day. I was introduced to a new beverage called “Sorrel.” In Mexico, a beverage is prepared called “agua de Jamaica,” which I love, and am very familiar with. Both beverages are made like a tea using the dried flowers of red hibiscus. The best comparison that I can make is that it is similar to cranberry juice, but not quite the same. The sorrel was unique, as a generous amount of fresh ginger was also infused into the tea. I’m not 100% sure, but I also believe that it might have had a touch of cinnamon and cloves added as well. In Jamaica, the beverage is mixed with rum (Siesta Key Rum would be awesome!). Audrey came out several times to ask me how everything was. I can’t convey enough how much they made me feel like I was a guest in their home, rather than a business. She must have seen one of the happiest middle-aged guys sitting there with the biggest smile on his face as she approached my table. I have a special place in my heart for Caribbean food. If you’ve ever studied the history of the food in the Caribbean, it is one of the fascinating places on Earth. Sadly, all of the native Arawak people are all gone now, but so many cultures from literally all over the world brought with them their culinary traditions and mixed them with local ingredients to create the varied cuisines of each island. I spent my honeymoon in Ocho Rios Jamaica 18 years ago this week. On one of our excursions, we went to the top of The Blue Mountains and rode bicycles back down to the sea. One of the most memorable meals of my life was the lunch that our guide prepared for us…jerk chicken, rice and peas that we ate about half-way down the mountains under the shade of a massive mango tree. The steep hills were dark green from the coffee plants that were growing, and they stretched forever down to the deep blue Caribbean Sea. What a humble meal, but one that I’ll never forget. When I ate that food today and closed my eyes, it took me back to that magical day 18 years ago, sitting in paradise with my new bride.